Josephine Montford is the daughter of one of New York's wealthiest families and her whole life has been planned out for her, she will marry a boy from another of the prominent families and her life will be one of ease and luxury. Jo may wish things could be different but she would never risk shaming her family by following her dreams of becoming a journalist. Everything changes when her father dies in suspicious circumstances, was it really an accident as the police claim or could it have been suicide, or even worse, murder? Jo knows she'll never be able to move forward until she finds out the truth about her father's death and she will do whatever it takes to get to the bottom of the mystery. She teams up with journalist Eddie Gallagher to investigate but the answers she finds may just change her life forever. 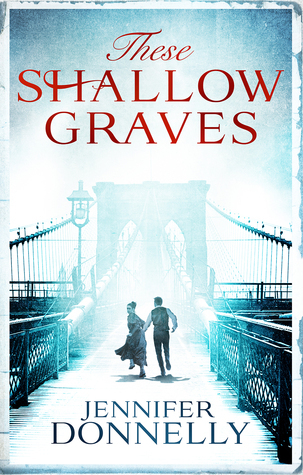 I was really excited to read These Shallow Graves, I've been hearing great things about Jennifer Donnelly's writing for a long time now so I went into this with very high expectations. The prologue completely sucked me in, it opens with a very creepy scene where Jo and her friends are sneaking around a graveyard digging up a dead body and from that point I was totally hooked. I guess from there I was expecting a very dark story but the tone gets much lighter in chapter one where we skip 2 months into the past to discover what led Jo to that graveyard in the middle of the night. The rest of the book does still touch on dark themes but it doesn't have that creepy vibe to the majority of the story. Jo is pretty much exactly what you'd expect of a young girl from a privileged background in 1890, she has been kept very sheltered by her family and is there for very innocent and naive. Jo has no clue what it is like for the poorer classes but she has seen how differently women are treated and how they are controlled by the men in their lives. She longs for the freedom to follow her own dreams but worries about what society and her family would say if they found out about her love of writing and her wish to make a career of it. I have to say I really loved how the book portrays the role of women in society, it has strong feminist themes and a lot of Jo's observations about the way women are treated are sadly still relevant today. I enjoyed seeing Jo mature as she spent more time in the real world investigating her father's death, she has a quick mind and although her innocence led her to make some stupid decisions, especially in the beginning, she really starts to come into her own later on in the book. I quite liked Eddie but the romance that develops between him and Jo wasn't as fleshed out as I'd have liked. Considering how long the book is I think I could have done with a bit more of them getting to know each other, their connection seems to build quite quickly, especially considering the rumours Jo hears about Eddie. I was actually disappointed that she didn't confront him about them in the beginning, I was sure she was going to ask him for more details and the fact that she just brushed everything under the carpet irritated me a bit. I think my favourite characters were actually Eddie's friend Oscar and a young girl called Fay who he grew up with. There were a lot of things I loved about the book but unfortunately there were a few things that didn't work quite so well for me. I was actually enjoying the mystery of what happened to her father right until nearly the end of the book, I'd made loads of guesses about who was the mastermind, why they were doing what they were doing and the secret identities of several characters and I guess I was kind of disappointed that I got them all right. You have to understand that I'm usually useless at guessing who did it in a mystery story so the fact that I'd figured out at least 4 of the major plot reveals kind of proves how obvious they were. I was so hoping for some kind of major twist that would completely shock me and it just didn't happen. I also felt that the book was longer than it needed to be, there were definitely parts of the story that dragged and could have been streamlined further. In spite of my niggles I did find These Shallow Graves a very easy book to read, I was interested enough in the story to keep reading and I like I already said I enjoyed the mystery right until towards the end of the book. Jennifer Donnelly has a writing style that I like and I'd definitely be interested in picking up more books by her in the future. The things that bothered me probably won't be an issue for everyone, in fact I've been seeing a lot of really positive reviews for the book, so I'd still recommend giving it a try if the blurb catches your eye.